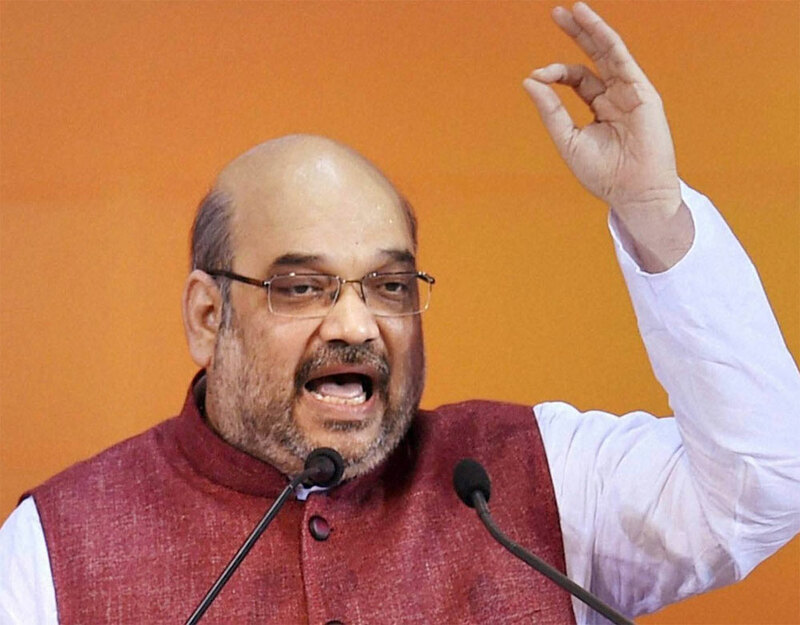 Hitting out at opposition leaders for being “unhappy” with air strikes on terror camps, BJP president Amit Shah on Thursday said his party would remove Article 370 from Kashmir “after forming the next BJP government” at the Centre. Article 370 of the Constitution grants special status to Jammu and Kashmir. Shah also slammed Banerjee for trying to mislead the masses on the National Register of Citizens (NRC) and the Citizenship (Amendment) Bill. Criticising West Bengal Chief Minister Mamata Banerjee for questioning the Balakot air strikes in a bid to “appease” the minority vote bank, Shah asked her to come clean on whether she, too, wants a separate PM for Kashmir, just like her ally and National Conference leader Omar Abdullah. “Mamata Banerjee and opposition leaders are unhappy with the air strikes. They are questioning it just to appease their minority vote bank. But, I want to say it loud and clear that we won’t allow such forces to win. “We would remove Article 370 from Kashmir after forming the next BJP government at the Centre,” he said, while campaigning for Darjeeling Lok Sabha candidate Raju Singh Bisht. The BJP vows in the National Executive meeting chaired by president Amit Shah to work to ensure the party’s return to power in the Lok Sabha elections with a bigger victory than 2014 when it had won a majority on its own for the first time in its electoral history, sources said. The BJP National Executive meeting chaired by president Amit Shah vowed to work to ensure the party’s return to power in the Lok Sabha elections with a bigger victory than 2014 when it had won a majority on its own for the first time in its electoral history, sources said. A slogan of “Ajey BJP” (Invincible BJP) was adopted at the meeting of the party’s national office bearers and also presidents of its state units. They pledged to work for the party’s victory in assembly polls in five states and a decision was taken to give extra emphasis on the elections in Telangana, which is likely to go the polls with states like Rajasthan, Madhya Pradesh and Chhattisgarh. “The BJP is confident of returning to power with more number of seats than it won in the 2014 Lok Sabha polls,” a source said. Shah inaugurated the office-bearers meeting and it will be followed by a two-day meeting of the party’s national executive. According to the report, filings with Registrar of Companies (ROC) revealed that turnover of Jay’s company Temple Enterprises rose 16,000 times after the 2014 Lok Sabha election . A day after news website The Wire published an investigative piece on the increase in the profits of a firm owned by Bharatiya Janata Party president Amit Shah‘s son, Jay Amit Shah , Railways Minister Piyush Goyal defended him by terming the report baseless. BJP terms reports by news publication against Jay Shah baseless. The report revealed a dramatic jump in profit of firm owned by Shah. BJP said Jay will file Rs 100 crore lawsuit against the publication. According to the report, filings with Registrar of Companies (ROC) revealed that turnover of Jay’s company Temple Enterprises rose 16,000 times after the election of Narendra Modi as prime minister. Goyal, while talking to media persons today rubbished the allegations and said that all the transactions were made through banking channels adding that Jay’s business was legitimate. Goyal pointed out that the article was a means to malign the reputation of Amit Shah. He said that Jay has decided to file a defamation and criminal suit of Rs 100 crore against the publication, reporter and editor. The Railways Minister said that every question was answered timely by Jay and added that loan taken from NBFC were paid full with interest. Meanwhile, downplaying the findings Goyal also said that Rs 80 crore was not a large amount in commodity business. According to the report, Jay suffered losses and decided to shut the company in October 2016. Earlier, senior Congress leader Kapil Sibal, while talking to the media persons took a jibe at the BJP government. He said that the change of power had also affected change in the fortunes of some people. Sibal alleged that the filings with ROC have revealed that the company owned by Amit Shah’s son started making profits after Modi came to power in 2014. As projected by most exit polls, the BJP swept the Delhi civic polls, in a contest that was widely watched nationally, coming as it did in the wake of a ‘BJP wave’ in recent Assembly elections. As the BJP headed for a landslide victory in Delhi MCD polls and AAP suffers crushing defeat, Swaraj India leader Yogendra Yadav said that Delhi has rejected Chief Minister Arvind Kejriwal and elected PM Narendra Modi. “People feel cheated by the AAP government. They went out to elect councillors but ended up rejecting the CM and electing the PM,” he said. On AAP’s charge of “manipulation” of EVMs, Yadav said that “It’s not the software of EVM, but it’s the software of the ruling party that needs to be changed”. As of mid-afternoon, the incumbent BJP had won 118 wards, and was on its way to a two-third majority. It has controlled the MCD for over a decade. For the Aam Aadmi Party (AAP), which is currently at second spot, it was a disappointing loss+ , coming as it did on top of a poor showing in the Punjab polls and a worse performance in the Goa polls. AAP had won 29 wards. The Congress was trailing at third spot, having been unable to sustain its buoyant win in the Punjab polls. It won 20 wards. As many as 2,537 candidates contested for elections to the three civic bodies on Sunday. The polls saw a 53.53% voter turnout, better than the previous occasion. And like before, unauthorised colonies, slum clusters and areas on the periphery of Delhi voted in large numbers with the urban areas giving a lukewarm response, PTI reported. AAP tried to pin BJP down+ on its record of running the three corporations for many years. However, the latter managed to counter any fallout of anti-incumbency with its strategy of putting Prime Minister Narendra Modi’s vision at the centre of its campaign. It also didn’t give tickets to its sitting corporators to address charges of “incompetence”. Most successfully, though, the BJP managed to caste the civic polls as a referendum on the AAP government, putting it on the back foot throughout the campaign. On its part, AAP promised it will scrap property tax, but the move ended up looking like a cheap poll gimmick. It also couldn’t successfully sway voters towards it by highlighting what it called “insanitary conditions” in the Capital – which the BJP-administered corporations were responsible for – which it blamed for the outbreak of malaria, dengue and chikungunya+ . AS for the Congress, it junked old war horse Sheila Dixit and put Ajay Maken in charge of the Delhi unit+ . In turn, Maken presented the Congress as the best alternative to the BJP which had run the civic bodies for over 10 years, as well as to AAP which was in government. The Congress said both stalled development work in the Capital. “BJP has accepted that its civic leaders were corrupt by not giving tickets to sitting councillors. The corporations were deep in corruption under the nose of Prime Minister Narendra Modi, but he didn’t take any action. He suddenly realised the truth while distributing tickets,” Maken said. Still, voters remained unconvinced, although Congress leader Shashi Tharoor said the party improved its vote share from before. The BJP, which beat anti-incumbency, said its win was a thumbs up for governance and a rejection of negative politics. AAP said it was a win for “tampered with electronic voting machines (EVMs). And the Congress said it expected to perform better but didn’t, for which Delhi unit chief Ajay Maken took responsibility and quit his post. BJP president Amit Shah credited Prime Minister Narendra Modi with the MCD win. “Voters have rejected negative politics and the party has won under the leadership of PM Modi,” Shah said. “BJP is the only viable option available for voters and that is why the party has been given mandate at every level,” Union minister Jitendra Singh told ANI. Some BJP leaders said Delhi chief minister and AAP chief Arvind Kejriwal should quit. “Arvind Kejriwal must resign, BJP will clean Delhi in four months,” said the BJP’s Manoj Tiwari. AAP, which started finding fault with EVMs even before the polls, squarely blamed them for the loss. “MCD trends in favour of BJP prove EVM tampering,” said AAP spokesman Ashutosh. Another of his party colleagues Nagendar Sharma similarly tweeted: After the five assembly elections, it was BSP chief Mayawati who alleged that EVMs were tampered with. That allegation was then picked by other parties. “This is not a (Narendra) Modi wave, this is an EVM wave. This is the same wave that they (BJP) used in the Uttar Pradesh, Uttarakhand, and Punjab polls,” said AAP leader Gopal Rai again today. As for the Congress, it expected to do a tad better, given its decent performance in the recent bypoll in Rajouri Garden, but it was not to be. Ajay Maken took responsibility for the loss and offered to quit the post of Delhi Congress chief. “It is a reasonable revival of the Congress but I had hoped for something better than this. I had expected to perform a little better,” he said, adding that he will now dedicate himself to party work. Former Congress Delhi chief minister Dixit blamed the lack of involvement of the local leadership for the civic polls debacle. “The party was not able to reach out (to voters) the way we should have. Any excuse can be given when you don’t want to do anything. The decision has to be taken by the high command. The leadership needs to introspect,” she said. The former Delhi chief minister rued that Maken failed to involve senior leaders including her in campaigning for the polls. “I was not asked for campaigning then how could have I gone for it,” Dikshit said. “Arvind, the unselfish hero who would never compromise, was dead. In his place was a politician who wanted to manipulate that support to fuel his ambition to become a PM in 2019,” writes Gandhi, who was a member of the core committee in the India Against Corruption movement, and later a National Executive member of the AAP. “Personally, I have closely seen my friend, hero and someone as precious as you become so vicious and ugly because of hunger for power. I have now become afraid of power. That is why I did not join any group or party after you removed me from the primary membership of the party using the dirtiest and filthiest falsehood,” he writes. “The country needs heroes. Are you one? The battle is between your Ego and the nation. What will you choose?” Gandhi asks in the end. Let me address the hero first. I remember how we used to speak for hours about how the personality or high command driven politics of India was destroying the nation- be it Cong or the BJP or the Thackerays or the Laloo, Mayavati and Mulayam. You hated that, then! You took time to remove me. And in spite of repeated requests to not punish the superb Maharashtra team to spite me, you threw out the entire Maharashtra AAP committees down to the lowest rung in Oct 2015. Can Modi or Sonia remove an entire State team with just an edict? We have outbeaten other parties with our arrogance and internal politicking. The other day, a young volunteer with tears in his eyes from rural Maharashtra asked me, “What is our fault?” What do I tell him, Arvind? Why was he removed? I remember in one volunteer meeting in Santacruz where we had a public argument. You felt that we should not give any importance to volunteers, they were just tools. I publicly contradicted you saying that these were some of the finest humans who had sacrificed for the nation. They are NOT pawns to be used-and-thrown. In your pursuit for power, you have betrayed my beloved nation. You have messed up the life of millions who followed you. They gave you complete power -made you convener and CM. Delhi gave you 67 seats just two years back. What more do you want? I do not know whether you know the reality or are living in denial – but are a very unpopular man in the country. If you do more drama, then it is going to get worse and we cannot afford that. BJP president Amit Shah today called upon the party workers to take the policies and programmes of the party as well as the Haryana government to the “grassroot-level”. He was addressing the ‘Pandit Deen Dayal Upadhyay Shatabdi Karyakarta Vistar’ workshop on the third and concluding day here. The event was not open to the media. Haryana Chief Minister Manohar Lal Khattar, state ministers Ram Bilas Sharma and Abhimanyu Singh Sindhu, state BJP chief Subhash Barala and senior BJP leader Anil Jain were also present on the occasion among others. Later, talking to reporters, a BJP worker who took part in the event said, “Amit Shah called on us to take the policies and programmes of the party and the state government to the grassroot level. He also told us to work as a bridge between the party and the government.” The BJP president also said benefits of development should reach “the last man”, what Pandit Deen Dayal Upadhyay had dreamt of, he added. The BJP president also said benefits of development should reach “the last man”, what Pandit Deen Dayal Upadhyay had dreamt of, he added. N Biren Singh will meet Manipur Governor soon to stake claim for forming government. He is set to become Manipur CM now. In a major development in Manipur politics on Monday, N Biren Singh has been elected as BJP’s legislature party leader. “BJP’s legislature party leader will be N. Biren Singh, unanimously elected; will soon move to stake claim to form govt,” BJP leader Piyush Goel said. Biren has thanked Amit Shah, PM Narendra Modi and other senior leaders. “I left Congress due to misgovernance, sure that BJP will give good governance to Manipur,” Biren Singh added. Earlier, in the day, Manipur CM O Ibobi Singh had said that he will resign in a short period of time. “I will tender my resignation (from position of CM) in a short period of time, either today or tomorrow,” Okram Ibobi Singh said. The development came after Ibobi Singh failed to muster the required numbers to form a Congress government. N Biren Singh will meet Manipur Governor soon to stake claim for forming government. He is set to become Manipur CM now. In a major development in Manipur politics on Monday, N Biren Singh has been elected as BJP’s legislature party leader. “BJP’s legislature party leader will be N. Biren Singh, unanimously elected; will soon move to stake claim to form govt,” BJP leader Piyush Goel said. Biren has thanked Amit Shah, PM Narendra Modi and other senior leaders. “I left Congress due to misgovernance, sure that BJP will give good governance to Manipur,” Biren Singh added. Earlier, in the day, Manipur CM O Ibobi Singh had said that he will resign in a short period of time. “I will tender my resignation (from position of CM) in a short period of time, either today or tomorrow,” Okram Ibobi Singh said. A few would be familiar with Khadagvanshi Kshatriyas. small community of peasants, they get dwarfed by castes with greater numbers, and were mostly overlooked by political parties. Community elders were, therefore, surprised two days before the area went to polls in 2014 when they were told by local BJP members that Amit Shah wanted to visit them. Shah knew what he was doing. The concentration of the community in western and central UP makes it crucial to the outcome in certain Lok Sabha constituencies. In the meeting, Shah invoked former UP CM Kalyan Singh, who is held in esteem by his hosts, and spoke of Narendra Modi‘s development message to try to persuade the Khadagvanshis to vote for BJP . The effort paid off, with the community agreeing to enter the saffron tent.Yet, it did not benefit BJP greatly because the message could not be conveyed to all members of the community in time. This time, Shah made it a point to connect with Khadagvanshi elders well before polling day and ensured that 600 youth were des patched on motorcycles to take the panchayat’s endorsement of BJP to all members of the community . The win is the result of hundreds of personal interventions by Shah to create a large social coalition. When the last round of polling closed, BJP sources said such initiatives could have boosted the party’s chances in at least 100 constituencies. A tireless slogger known for his hands-on style and an unwavering belief in micro-management, Shah emphasised -this time more remorselessly than in 2014 -on winning potential rather than reputation and age. The decision to bench Shyamdeo Rai Chaudhary , who had won the Varanasi seat seven times in a row, was taken despite Shah’s personal regard for the man. The decision to field Avatar Singh Bhadana, former Congress MP from Faridabad in Haryana, in western UP raised eyebrows. Shah went ahead because he needed to rally Gujjars around BJP , a vital necessity at a time when there was a fear that the Jats might drift away . The decision not to project a CM candidate was taken because of Shah’s belief that BJP could ride on Modi’s popularity while avoiding getting sucked into caste animosity . His decision to admit many members from other parties, particularly from BSP , was mocked by rivals who said the opportunism showed that BJP lacked bench strength of its own.Shah, however, felt that peeling away BSP’s MLAs, especially important ones like R K Chaudhary and Swami Prasad Maurya, was necessary to undercut the perception about Mayawati being the main challenger and to get it cast as a party of Jatavs.Likewise, non-Yadav SP legislators were welcomed to frame SP as a Yadav outfit, a point that was harped on consistently by local campaigners among other backward communities.